Marty Finkle joins Deidre & JG to chat about his mission of helping others help themselves! Our special guest and dear friend, Marty Finkle, joined us to chat about his personal and professional mission that he started 35 years ago to help others help themselves. Marty is the CEO of AscendU Group, a public speaker, and a coach. His journey is definitely something we can all learn from and live by. Marty was recently diagnosed with stage 4 metastasized lung cancer and given 3-18 months to live. Since his diagnosis, Marty has been living his mission even more than before. Check out Marty’s wiZdoms below and don’t forget to listen to our episode! How have you found success? Not everyone wants to learn, but you have to choose to empower, educate, and guide. Success for me is focusing on the things that make an impact in people’s lives and watching them be outstanding. What is one thing listeners can do to help someone help themselves? Be open and honest. With my diagnosis, I became public about it instead of wallowing in self-pity. Allow yourself to be vulnerable and people will care enough to share back. Do you ever feel angry about your diagnosis? First it was disbelief and shock and then there was anger. But I decided that I was not going to give up. I can get mad and sad sometimes because I don’t want to leave, but surrounding myself with friends and family keeps me going. How do you know what to say to someone in a similar situation? Be blatantly honest. Give people permission to ask you questions. And don’t wait until a diagnosis! Let’s not wait until were faced with something life threatening like this to start having these meaningful conversations. It’s okay to be honest about our feelings. What advice can you give to others on being brave? Live a life of bravery by being open about what you’re going through. Have the courage to be vulnerable every day. The way you choose to not feel lonely is different for everyone. I was very public about it because it gives me energy to be with people. It helps me to not feel lonely to surround myself with family and friends. Promise yourself not to be lonely and let people in. It’s important to remember that no one fights alone. 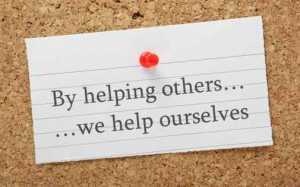 LISTENERS: What do you do to help others help themselves? Share your experiences and wizdoms with us! Either leave us a voicemail at 1-646-653-9278 or send us an email. We may talk about it - or we may even talk with YOU - on the air!